This past weekend the Flappy Bird had its wings clipped. Last Saturday the game’s creator, Dong Nguyen, tweeted that he would be taking the game down from both the App Store and the Google Play store. 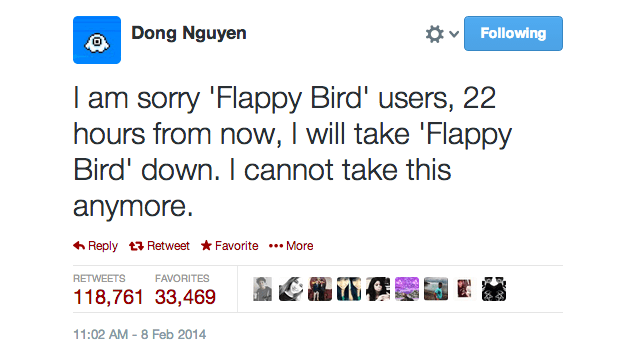 Flappy Bird was the mobile game that was all the rage , pun intended. According to Buzzfeed, it was the number one download in the App Store for almost a month. And it’s quite easy to see why. The game puts you in control of a little bird who can’t fly on his own. Your job was to keep him afloat by repeatedly tapping the screen and help him get through the pipes as far as you can. Some people just said “No”. Others got religious about it. Some people even went as far as posting parody videos on how to “truly” beat the game. Although Flappy Bird is officially off the market, other developers are trying to continue the trend with titles such as Fly Birdie- Flappy Bird Flyer and Clumsy Bird. It is still unclear as to why Nguyen has taken the game down. I honestly didn’t even bother playing this game, but this has got to be one of the most entertaining trends I’ve seen in a while. lol. Seeing people get so flustered over a little bird is hilarious to watch.